I know it's a terrible terrible pun, but I'm not apologising for it, because it makes me grin, and with the week I've had, that's a much needed thing. When I first bought my wheel, it came with three bobbins, and I kinda thought I might need more, but figured three was enough to be getting on with. Which it mostly was, for about the first week. Since then, I've been desperately trying to justify buying more bobbins, and specifically, high speed ones, to help me spin finer yarn. 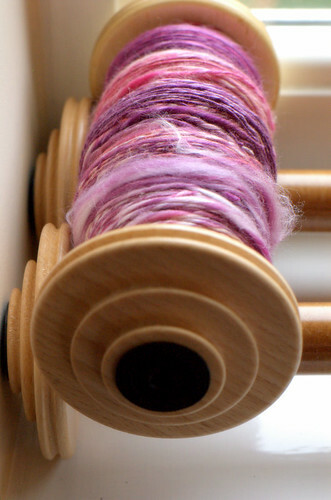 Typically enough, in that time of self denial, I've slowly developed techniques for spinning fine yarn on the normal ratio bobbins and since they're all full of lace weight singles, it follows that having finally gotten hold of high speed bobbins that I'll have an urge to spin heavier weight yarn. Since the odds of anyone feeling confident about what I want or need to brave the P&M Woolcraft site to buy me bobbins for my birthday without me knowing about it were fairly small, these were purchased using birthday money. Two were bought using money from my mum and the other one - well the other one is a little bit special. Since meeting K, my lovely boyfriend last year, I've been welcomed into his family in a way I didn't expect but am extremely grateful for. I was very touched that his parents brought birthday presents for me with them when they came to stay with us a few weeks before my birthday, but was entirely overwhelmed to get an unexpected birthday card in the post the day before my birthday. I don't tend to get birthday cards through the post so I was a bit curious. It turned out that his grandparents had not only remembered my birthday, but had sent me a birthday card - which was surprise and delight enough, but as I opened it, a banknote slid out into my lap. It wasn't expected, and it wasn't much, but it was almost enough to buy one bobbin and so instead of the two I was originally going to buy, I bought three. I think they'll appreciate it when I tell them what I used the money for. His Gran crochets granny square afghans despite her sight failing, and his Grandpa was taught to spin as a child by his mother and the last time we met, we had a lovely chat about it. I've got a plan too. It may not be entirely do-able given the timescale, but I have a plan to spin up some yarn and knit or crochet them both something for Christmas. Now to find the perfect patterns.